Why is the British Military so good? ? Thread: Why is the British Military so good? ? Re: Why is the British Military so good? ? I was a big fan of Sgt. Rock, Weird War, Sgt. Fury, and the Haunted Tank when I was a kid, read them all through the military as well. Haunted Tank may still be in publication too. The ghost of General Stuart transferred his flag to an Abrams last I saw. Just to take us even further off topic, didn't I see something by Nick on the Centurian tank somewhere? I forget which major land battle on the European continent, durring WWll, did the Brits play a pivotal role? That is to say without their participation the outcome may have been different. Oh, that’s right, none. But let’s give credit where it is due their air corp was very good and their navy occasioned to show up and fight now and then. But their land forces not so much. I would say they were reliably unreliable. The Brits had a measure of success in North Africa and after that, nothing. Others have pointed out the long tradition of the weakness of the British army, a tradition they continue to uphold to this day, and I shall not repeat the point. Nonsense. There is always some excuse for the poor execution of British land forces. The Brits (land forces) didn’t offer any significant contribution in any theater in which they faught. They certainly did not contribute, in any major factor in the land war on the European continent. You mentioned Burma being difficult for the British, so was Guadalcanal. In fact, we were spread thin AND short on supplies. At one point all they had to eat was peanut butter. It has been previously stated by others that, on land, the only tradition the Brits have is loosing, and I will their points to make mine. I will say that 32Bravo is right on the money. Nonsense Raising Sun. There is always some excuse for the poor execution of British land forces. The Brits (land forces) didn’t offer any significant contribution in any theater in which they faught. They certainly did not contribute, in any major factor in the land war on the European continent. You mentioned Burma being difficult for the British, so was Guadalcanal. In fact, we were spread thin AND short on supplies. At one point all they had to eat was peanut butter. It has been previously stated by others that, on land, the only tradition the Brits have is loosing, and I will their points to make mine. I will say that 32Bravo is right on the money. Was attempting to respond to yours of 2/22/16. 42Bravo is correct. And it is not being hard on the Brits simply to recite the facts of history. And it should be noted that the opponents facing the Brits had difficulties of their own and somehow they managed to prevail while the English failed to execute. Right on 32Bravo, just one thing, where is the evidence that the Brits ever learned? This is why Monty was rather unsuccessful because he failed to consider what the enemy can do vs his idea of how good he and his men were. I forget which major land battle on the European continent, durring WWll, did the Brits play a pivotal role? That is to say without their participation the outcome may have been different. First one was probably Arras, which halted the German advance. Operation Goodwood in which they pincered in with American and Canadian forces resulting in the Falaise Gap. The lightening assault into, and rapid liberation of, Belgium (albeit undermined by Monty's massive blunder and failure to clear the Scheldt Estuary). Operation Market Garden, which was overall a failure but still certainly showed the potential heroism of the Tommy, even if in vain..
Last edited by Nickdfresh; 08-20-2018 at 08:35 AM. There was one operation in which the British did sort of okay, (in between Honey Butter Crumpets, and Ceylon Tea) what was it again, oh yeah, operation Chariot. I believe they went in order to post some unflattering posters of Hitler, and then Hee-Haw as they left,perhaps even a bit of toilet papering as well, but the plan didn't go quite as planned. 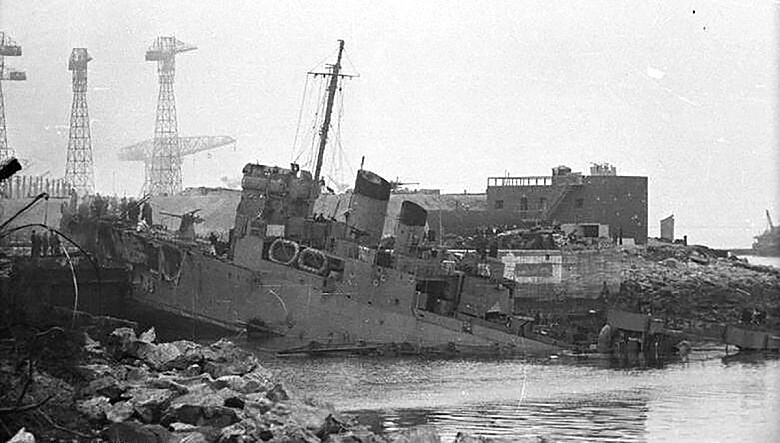 (British can't get anything right you know..) instead of being rude to Hitler, they mistakenly destroyed the only Dry Dock facilities that could have held the Bismark for repairs. Just Bad Form if you ask me,, Seems it took several years to finally repair the Dock. Never mind all of that inconvenient shore battery fire, tis but a scratch. Well, the British had to do something with all of those Victoria Crosses that they had laying about, cluttering up the Palace. Nickdfresh, great cover for the hapless Brits. I ask for battle field action by the British army. Most of what you sited only makes the point. The Brits were dismal in Holland and Market Garden was worse. I wonder if the Germans had any respect for the British army? And yes they certainly were great at planning but they could not execute. Blame it on Monty. This pointless defence by you and Nick of consistent British incompetence and cowardice for the whole of WWII is intolerable, and all the more so coming from Americans. You appear to be referring to the raid on St Nazaire. I make only two points to undermine your empty defence of the British. 1. HMS Campbeltown was an American lend-lease destroyer, previously the USS Buchanan, so once again Britain didn't really contribute anything to this operation and couldn't have executed it without American help. 2. Anyway, the Brits didn't succeed as the incompetent Brits ran the USS Buchanan aground and destroyed it, as shown in the following photo. Please refer and apply Nick's post at #84, because otherwise nobody has any idea to whom or what you are responding. Click "Reply with quote" bottom right under the post to which you are responding and then put your text under the quoted post.